In the most radical move: Rome’s Maxxi: the National Museum of XXI Century Arts has executed a dramatic “mise à nu” to peel away any artifice of materiality, exposing the stark presence and beauty of the space of sound by emptying its galleries. 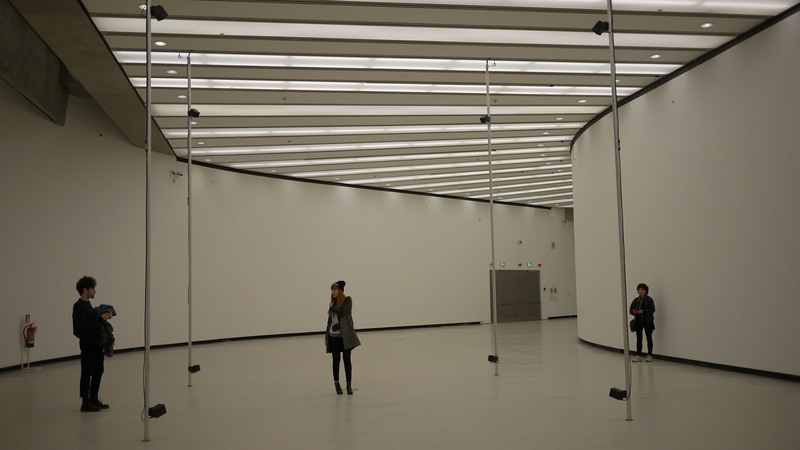 Curated by the Maxxi visionary-director Hou Hanru, the Open Museum Open City exhibition has eliminated so-called “visual art” in order to refocus the viewer experience on sound works by Bill Fontana, Justin Bennett, Ryoji Ikeda, et al. The resultant mix is a sonic collage that infiltrates the space stripped bare to its white walls. The overall uber-concept of this revolutionary idea is startling in its sheer simplicity and daring, leaving the viewer to reconsider not only what it means to “look” at art, but the significance of entering and navigating the space of a museum. In Justin Bennett’s Hyperforum for example, the viewer(s) inhabits a cubic environment of recorded sounds, drawn from a myriad of locations and sources, creating a new ordering of the space through 8 equidistant speakers that define a multi-channel cube. Within the cube, sound coalesces to rearrange the sources of origin by going beyond even the suspension of disbelief. You are simply there: listening and virtually inhabiting the sonic architecture. Through a severe act of reductionism, Open Museum Open City has removed the largesse of the Spectacle in order to expose the pure essence of sound, powerfully re-articulating our sense of connection to the world around us. For unlike the image, which can never perfectly render visual information, sound can in fact be an accurate and realistic representation of its origin. Sound is a form of virtual reality that can remove any differentiation between the world outside and its electronic diffusion: a perfect medium for opening up the museum and dissolving its boundaries. Hou has employed techniques of acoustical realization to activate the museum as a space of social relations, what he describes as a contemporary “Roman Forum.” In the present day circus of contemporary art fairs and the like, Open Museum Open City invokes the ancient social model as a gesture of defiance, an act of purification, the Spectacle stripped bare.